B.K. 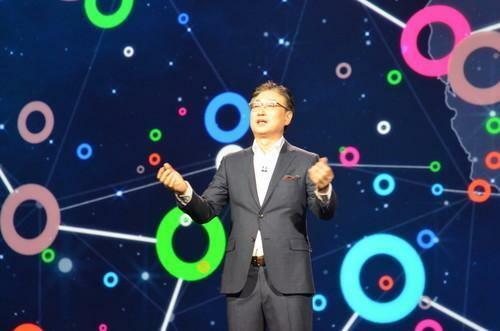 Yoon, head of Samsung's consumer electronics division, offered an optimistic view of the future, in which all devices from TVs to heating systems and automobiles will be connected to the Internet and sharing data for the betterment of humankind. "Each of us will be at the center of our own, adapting IoT universe," said Yoon, predicting that chairs will automatically detect when we've been out in the cold and heat themselves up so they can warm us when we sit down. Except the world he described didn't sound that wonderful at times. Imagine your insurance company can monitor everything happening with your car and use that information to provide you with better services, he said. It might be a dream for an insurance agent, but it's a level of sharing that people less trusting of big businesses might rather do without. Past CES keynotes have drawn on star power to keep them rolling along. Last year, Yahoo's Marissa Mayer was joined by cast members from the TV show Saturday Night Live, while Qualcomm's Paul Jacobs called on Big Bird, Steve Ballmer and even Archbishop Desmond Tutu. There was none of that from Samsung. Yoon's first guest was the president of a group called the Foundation on Economic Trends, who proclaimed rather dryly that the Internet of Things marks a "paradigm shift" that will transform the global economy. "The Internet of Things brings the human race together as a single, extended human family for the very first time in history, allowing us to share our social and commercial lives in a way that's never been possible before," he gushed. It was a lot of happy talk, but it largely ignored the challenges to privacy and security that might come with it. Yoon made a good case that the Internet of Things is gathering steam. By 2017, he said, 90 percent of the electronics products Samsung sells will be IoT devices, including all its TVs, smartphones and tablets. But the scenarios that tech vendors offer for the connected home are becoming tired, and there's little evidence that they'll be implemented seamlessly for consumers any time soon, particularly with competing software platforms from Apple, Google and other players. The Internet of Things needs standards to reach its potential, Yoon said. He pledged that Samsung will create "an open IoT ecosystem," one that works with all OSes and devices. But there are other obstacles he addressed only briefly. "Security needs to be baked into the hardware and software at every level," Yoon said, but it was the briefest of mentions, and seemed out of step with the magnitude of the challenges that malicious hackers could present. "It takes more than one company, more than one industry, to create this IoT universe," he concluded. "We all have to work together." Now he just has to convince the industry to make that happen. The whole keynote can now be viewed on the web here.